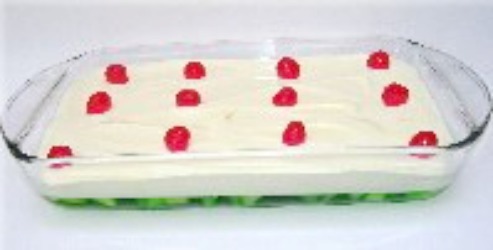 Jello Dessert Recipe is a layered dessert of Lemon Pie Filling, Lime Jello and fresh or canned pears. Top with whipped cream, sprinkled with Graham Cracker crumbs, chopped pecans and Maraschino Cherries, for an old fashioned Christmas dinner or any day delight. The top can be sprinkles with various chopped nuts or crushed cookie crumbs of your choice, if you prefer. Included below is a delicious Strawberry and Banana Jello Dessert recipe that is perfect for a red Christmas or Valentine's Day. Bring 1 cup water to boiling point. Sprinkle on dry Jello and stir about 3 minutes until all granules are dissolved. Stir in the other cup of cool water. Add chopped pear. Pour into a 9" x 11" oblong glass dish. Place in refrigerator about 2 hours until congealed. Pour cold milk into a cold mixing bowl. Sprinkle in instant pie filling mix. Whisk 2 minutes. Whisk in whipped topping until all lumps are gone. Spread pie mixture on top of jello and return to refrigerator for at least another hour. Sprinkle top with Graham Cracker crumbs, chopped pecans and Maraschino Cherries. For best flavor, let set in refrigerator overnight. *Canned pears can be substituted, but they don't provide that full flavor and crunchy texture. **If using another brand of instant pie filling mix, prepare according to directions on box. Some brands differ in amount of milk to use. Graham Cracker crumbs and pecans as in above recipe if desired. Put together according to directions above. The strawberries and bananas can be included in the jello. If you prefer to put the strawberries on top instead of in the jello, fresh one work best. This also makes a great "red" Christmas Jello dessert!